Welcome to Gatlinburg Treasure! 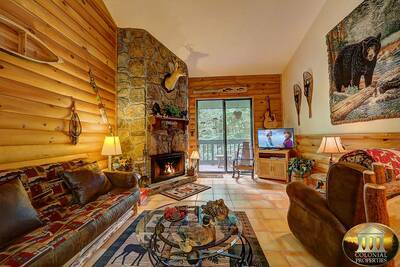 This 2 bedroom, 3 bath Smoky Mountain cabin rental offers an absolutely breathtaking view of downtown and into the Smokies. Upon entering this amazing vacation getaway, you and your guests are immediately wrapped in luxury and beautiful natural wood surroundings. The ever so relaxing living room features leather furnishings, stone accented fireplace and a flat screen TV with surround sound. Located next to the living room is the wonderful gaming and entertainment area. Here you can challenge your friends and family to an exciting game of pool or sit back and watch the competition unfold while enjoying the view. The entertainment area also features additional seating and a wet bar with mini fridge for added convenience. Gatlinburg Treasure features a marvelous upgraded fully equipped kitchen with stainless steel accented appliances and beautiful granite countertops. Here you can prepare a gourmet dinner, delicious lunch or appetizing breakfast for you and your guests. One of the great amenities found at Gatlinburg Treasure is your very own private sauna located on the main level. The sauna's benefits are numerous. It is so relaxing and leaves your body soothed and your mind serene. It's main advantage lies in the fact that it promotes sweating, helping the body to rid itself of toxins. It is also believed that exposure of the skin to heat stimulates the production of white blood cells and strengthens the immune system. 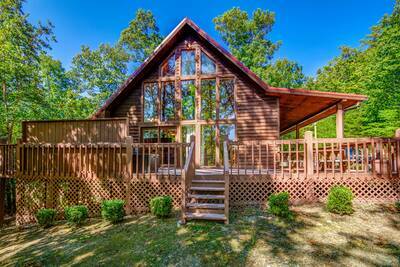 There is also a bath located on the main level of this Gatlinburg cabin rental for additional convenience. Venture down the stunning wooden spiral staircase to the lower level of Gatlinburg Treasure and you’re greeted by the 2 luxurious king bedroom suites. Both bedrooms feature relaxing appointments, deck access, TV’s and in-suite full baths for added privacy. 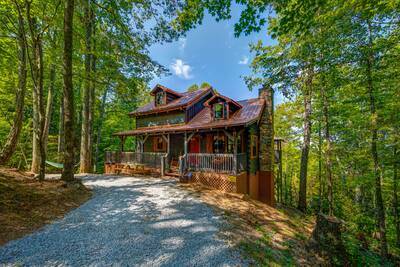 At this breathtaking cabin rental, you and your guests will definitely want to spend some time enjoying the beautiful view of the Great Smoky Mountains and downtown Gatlinburg. With two levels of spacious decking, you’ll have plenty of space to enjoy it all. The main level deck offers outdoor speakers and rocking chairs for the ultimate relaxation experience while the lower level deck features patio seating and the bubbling outdoor hot tub. With it’s super convenient location near downtown Gatlinburg and the Ober Gatlinburg Ski Resort and Amusement Park, you’ll enjoy quick access to all of the fantastic attractions, shopping, dining and entertainment options in the Smokies. When staying at Gatlinburg Treasure, we do recommend high clearance vehicles or 4-wheel drive in inclement weather. 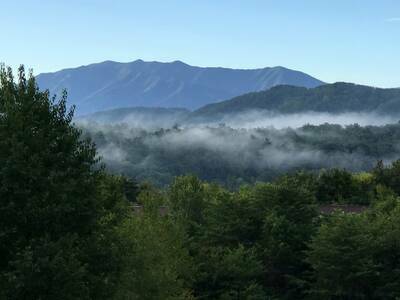 Gatlinburg Treasure offers luxurious features, a wonderful location and an amazing view that you and your guests will love and admire while staying here on your next vacation getaway. Reserve your stay in the Smoky Mountains today! A: Correct, at this time there is no internet access at this property. A: Hi Penny! At Gatlinburg Treasure, we do recommend high clearance vehicles due to the incline of the driveway. Your Lexus RX350 would be the best fit for the driveway. A: Hi Rylan! We recommend higher profile vehicles for this property. A: Hi Roger! When staying at Gatlinburg Treasure, we do recommend high clearance vehicles. “ The cabin was beautiful as well as the view. I can't say enough good things about this cabin other than we have stayed in 8 different chalets and this was our favorite by far. We saw a momma bear and 2 cubs in the driveway one morning which made our day!! The driveway is very very steep so be cautious going up and down it. We will for sure be back to this cabin!!! “ Our cabin was everything the ad said it was, the view was awesome, very pretty inside. Really clean when we got there. If you are going to Gatlinburg for the view this is the cabin for that. “ The cabin was beautiful and very clean. It was nice having a deck to sit on in the mornings to watch the sun rise over the tall mountains in view. Beautiful scenery, and you can see the town lights below at dark. 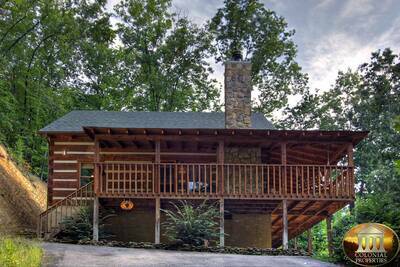 “ We enjoyed the cabin rental and would vacation in Gatlinburg again. “ We stayed in Gatlinburg Treasure to celebrate our anniversary. It was a beautiful cabin with a wonderful view. I enjoyed sitting on the deck and watching the tram go by. Will definitely stay in this cabin again. “ What a beautiful cabin we stayed in. Just the little details like a selection of dvd's,even board games were provided to make our stay even more welcoming.Not to mention the glorious hot tub that I definitely took advantage of, I even tried the sauna. A wonderful weekend break, next time we're going for a week. “ We loved the cabin!! Great view of the mountains and Gatlinburg! Cant wait to stay again! We hope we will be able to get this cabin on our next trip! All around great cabin!!! “ The cabin was very nice and the view was terrific. “ The cabin was very comfortable. We enjoyed the fireplace, playing pool, the hot tub and the sauna. The view was spectacular. Roads and driveway were very steep. You definitely need an SUV or 4 wheel drive, especially in the winter. Skiing at Ober was fun. “ The Gatlinburg Treasure was amazing! The view was exactly what you'd want if you took a trip to the Smokies. It was very comfortable and welcoming. The only downside is the very steep driveway. I would suggest an SUV or a larger car to traverse the wild terrain. But that's to be expected in the mountains. The view more than made up for the driveway! “ Great cabin with a beautiful view. Enjoyed the visits from the bears. “ It was our first time vacationing in the Smokies and it was definitely worth it. It was so nice to be away from the daily rush and to be able to just enjoy the peacefulness of the mountains. 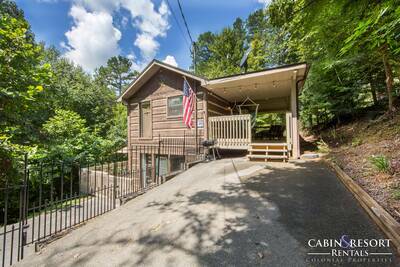 The Gatlinburg Treasure is a great property and it does not disappoint. There really is nothing like waking up to the amazing view in the morning as the sun is rising over the mountains. “ Absolutely loved our cabin. We had an awesome view. Plus the beds are super comfy too which is always a plus. The driveway is very steep so an SUV is a must. “ The cabin was wonderful! We had a mama and two cubs visit every day. Great place to stay! Hopefully we can make plans to stay here again. “ The cabin was great exactly as expected. Easy access and check-in and check-out process was easy!! 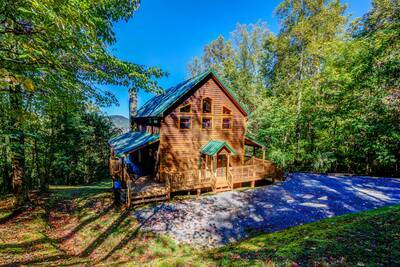 “ This cabin was a wonderful place to stay for our trip to the smokies! They spare no expense for the comfort of their guests! Also colonial properties go out of their way to make sure your stay is enjoyable! we loved everything about our cabin and hope to book it again next year. “ We spent a week in this cabin with our Son, Daughter-n-law and 2 grandbabies (ages 1 and 5). The Cabin was beautiful, It had breathtaking views, had all the convenience and essentials of home, The kitchen was well supplied for cooking meals, had plenty of room for the kids to play. There is nothing more that I can think of that I would've added to make things any better. It had it ALL. Even a Momma Bear and 2 cubs every morning playing in the yard for entertainment. The driveway is steep, and I will say a SUV / or 4x4 truck be used. But that was no big issue being we had 4x4 trucks. Plenty of room to park and turn around. Only a 10 minute beautiful ride back to downtown Gatlinburg, and a couple of minutes from Ober Gatlinburg. It was very clean and modern / country decor throughout. We have been to Gatlinburg / Pigeon Forge / and Cherokee many times and stayed in motels from the best to the Mom and Pop ones and have had fun. But this was our first cabin rental, and I guarantee this will not be our last, after having such a great experience with this one, Thank you Colonial Properties for this memorable, beautiful, relaxing vacation ever. “ It was a breathtaking view of the Smoky Mountains! The chalet was very nice, modern decor, clean & equipped with essentials. Be prepared to see bears...we saw three. Also, the driveway to the cabin is very very steep. You need a 4X4 vehicle. If you like the mountains and want seclusion, I would definitely recommend this place. We will always remember this experience with a smile. “ There was a group of 5 of us who decided to take a road trip from Michigan to the mountains of Gatlinburg! This cabin was amazing and looked exactly the pictures! We were all amazed by how big and cozy the cabin was, but more importantly the view was spectacular!! We could see the town from the deck and watch the Pber Gatlinburg Lift go up and down all day. Probably the best part of the trip was the jacuzzi that we relaxed in every night after a fun filled day of sightseeing! I will definitely be checking into more cabins like this and recommending this company to family and friends! !